Immigration Is Driving Broad Demographic Shifts In U.S., Report Says : The Two-Way An analysis by Pew Charitable Trusts shows that immigrants are increasingly moving from "gateways" such as New York and Texas into states in Middle America. 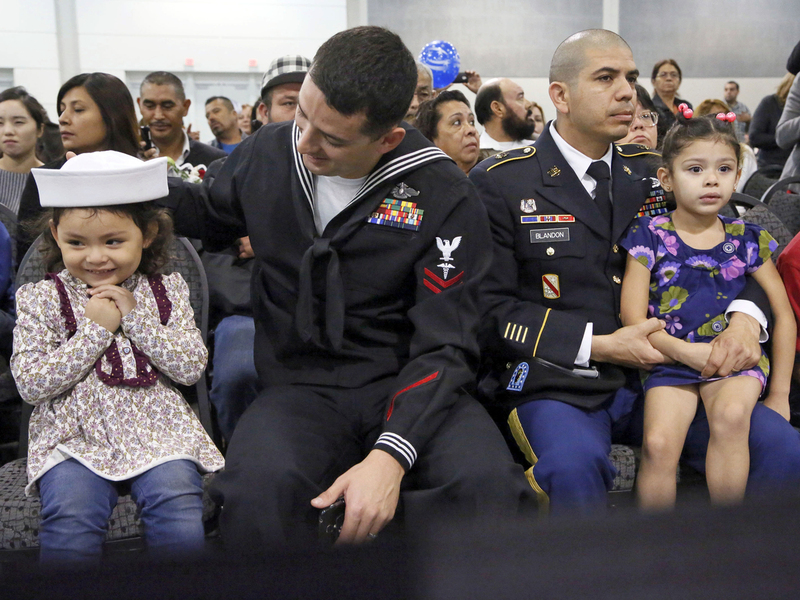 Navy Petty Officer Jimmy Dial (left) sits with his daughter, Kimberly, beside U.S. Army soldier Henri Blandon and his daughter as the men's wives and the girls' mothers become U.S. citizens at a naturalization ceremony last month in Ontario, Calif.
Native-born Americans are making up a smaller percentage of those living in some areas of the U.S. as immigration moves to become the key factor in population growth within the next quarter-century, according to a new analysis by the Pew Charitable Trusts that examined county-level census data. The U.S. Census Bureau has projected that migration to the U.S. will become the primary driver of population increases sometime between 2027 and 2038, but Pew's Immigration and the States Project has taken a closer look at the trend. -- The percentage of immigrants in the "gateways" of California, Florida, Illinois, New Jersey, New York and Texas, has decreased, while as a percentage of the population, they have increased in other states, including Nevada, North Carolina and Washington. The numbers include both legal and illegal immigration to the U.S.
-- Immigration is driving population growth in the Sunbelt, Pacific Northwest and Mountain states. According to Pew: "Several states not traditionally regarded as destinations for immigrants also saw substantial growth because of immigration, including Washington, North Carolina, Maryland, and New Mexico. In Maryland, 22 of 24 counties experienced growth in foreign- and native-born populations, with the former accounting for an average of 24 percent of growth." -- The portion of native-born Americans in some parts of the country has fallen. This change is mainly concentrated along a north-south axis from Montana and North Dakota to Texas. Pew says: "[The] native-born population decreased in the counties running down the nation's midsection, and along the Mississippi River in southern Arkansas and western Mississippi, as well as in some other isolated areas. Counties in the Great Plains that had relatively small populations to begin with lost a substantial portion of their native-born residents. Approximately two-thirds of counties in North Dakota, Kansas, and Nebraska experienced some decline in their native population; those counties had an average decline of 12 percent." -- Immigration has slowed population declines in many of those same areas in Middle America. Pew says: "In a swath of counties running from the Dakotas to the Texas Panhandle, and in the southeastern corner of Arkansas, the native population declined while the foreign-born increased. In the counties indicated by light green, the growth of the foreign-born did not fully replace native-born loss, but the population would have declined even more if not for the growth of the immigrant population."